Who is the dashing chap in the pit of that 109? He achieved a total of 275 victories during World War II: 272 on the Eastern Front, of which 241 were against Soviet fighters. He flew a total of 621 combat missions, was shot down eight times and was wounded three times. He fought 1940 in the Battle of France, the Battle of Britain, 1941 in the Balkan Campaign and over Crete. By the end of the war, he reached the rank of Major and was the commander of Jagdgeschwader 300 when the war ended. He claimed all of his victories in the Messerschmitt Bf 109. I met him in 2001. Here's the story on the above pic and this one as well, both obviously taken on the same day. These pic's were taken at an airshow near Detroit, Michigan in Ypsilanti during August 2001. Ypsilanti was one of the manufacturing hubs for the B-24 Liberator. During WWII my grandmother stitched the fabric on the B-24 Liberator's rudders. 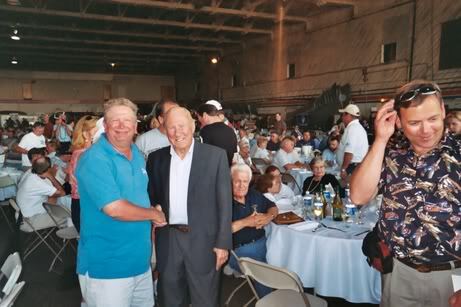 After the airshow, the organizer's put on a dinner and the three of them were the special guests (Gunther Rall, Charles Elwood "Chuck" Yeager, and Clarence Emil "Bud" Anderson). I was able to speak with them about their experience's during their flying days. If you look in the background you'll see a P-51 parked near the hanger doors. That P-51 is "Glamorous Glen III", flown by Chuck Yeager while assigned to the 357th FG in WWII. After the dinner the three men were signing photographs and memorabilia, during this period I was able to speak with Gunter Rall. I initially spoke with him in my broken German and he smiled and said "hello, how are you Herr Humphrey". I told him of my time spent in the service and that I was stationed in Stuttgart, Germany for six years. He was a very kind man and had a somewhat quiet stature. We spoke for about 15 minutes and then he had to go back to signing photos. When the folks were filing out, my father (Ed), uncle (Addison), and I were talking with an elderly gentleman at the wing tip of that plane. An African American, 80'sh. We were talking airplanes when he looked at me and asked, "Are you an aircraft mechanic?" I said, "Yes Sir, I was in the Army and was trained as a helicopter mechanic." He looked at me and said, "I was trained as an aircraft mech as well by the Army, I was then shipped off to Italy to serve with the 99th FS, 332nd FG." That floored me as I was speaking with a Tuskegee airman face to face. 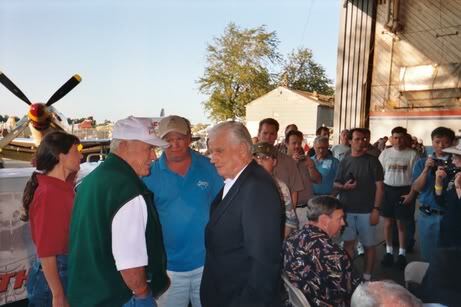 Just then Bud Anderson, Chuck Yeager, Gunther Rall, and another shorter gentleman walk up to our conversation. Chuck looked at the man and asked, "Mike how you doing? Are you giving this young man the once over about the plane?" Mike said, "Hi, Chuck, yeah this kid is an Army aircraft mech too." At this point I felt somewhat embarrassed. Mike then said to me, "would you like to get in the plane?" Of course I said "YES". Mike then looked at the shorter man, he was wearing a straw hat, and asked, "Jack, how about letting the kid sit in your plane." The man said, "Sure if he can open it up." I climbed on the left wing, popped open the canopy handle and climbed in. Next thing you know Chuck and Bud were on either side of me standing on the wings giving a personal once over of the cockpit. I couldn't believe what had just happened. I climbed out of the cockpit and shook everyone's hand, thanked them all for an awesome day. As my dad, uncle, and I walked away heading back to our car, my Dad said, " Do you know who that man was in the straw hat is?" I said, "nope". He said, "that's Jack Rouch." At the time I still didn't know who he was, later I found out he's the Owner/Operator of Rouch Racing (NASCAR). It was a once-in-a-lifetime experiance that I'll not forget. Wow! Quite a story, DH.